Llandudno Station, North Wales. 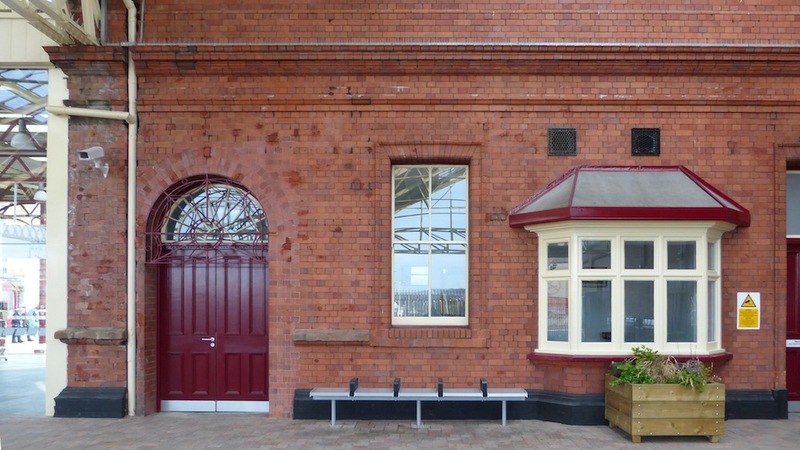 This building, of "fine red Ruabon brick," dates from 1892 and is much larger than the old stone-built station of 1858 — but "functional rather than impressive" (Lawson-Reay 4). It stands on Vaughan Street, which was laid out as an approach to the original station, at the southern edge of the seaside town. The bigger station was needed in the later period because the resort had become so popular: Llandudno was then in its heyday. The line was first opened by St. George's Harbour and Railway Company, then absorbed into the London and North Western Railway, until this became part of the London, Midland and Scottish Railway in 1923. Post-nationalisation, it is now run by Arriva Trains Wales. Left: Station offices by the concourse. Right: The old London, Midland and Scottish Railways monogram on a platform entrance. The old Victorian carriageway between the main platforms, which allowed Hansom cabs to take and meet passengers straight to or from the train (see Lawson-Reay 118), is still there. 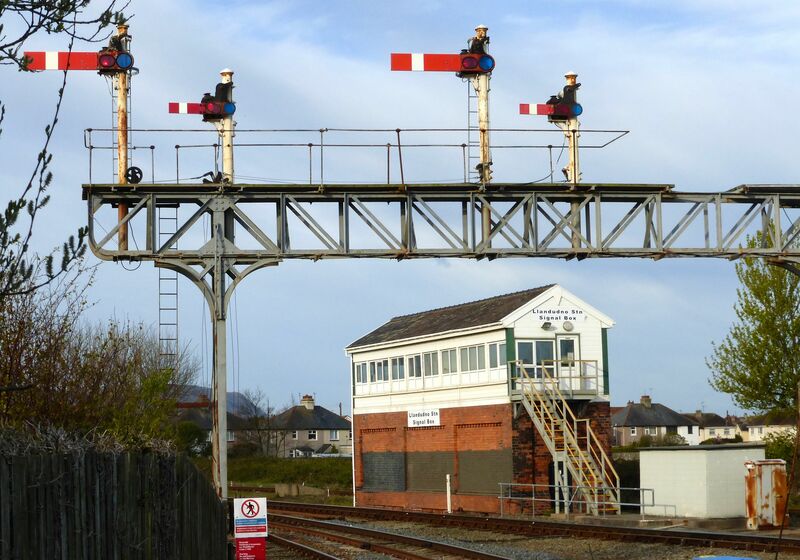 The information board says, "Note the signal box and traditional signal gantries at the end of the platforms." 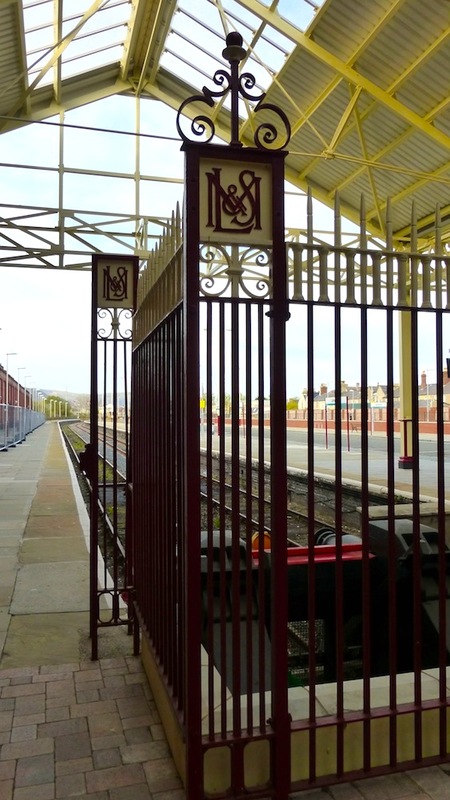 Llandudno is still popular, but these days many visitors come in by road, and the station has undergone various changes as a result of waning demand. In particular, half the frontage was demolished in 2009; the glass roofing has been cut back, too. But even now it has an unexpected breadth, and it is just possible to catch a glimpse of what it was like in those busy, bustling late Victorian times. Jones, Ivor Wynne. Llandudno: Queen of Welsh Resorts. 2nd rev. ed. Ashbourne: Lamdmark Publishing, 2002. Lawson-Reay, John. Llandudno History Tour. Stroud, Glos. : Amberley, 2015.